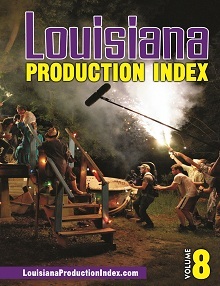 The inaugural Louisiana International Film Festival (LIFF) will be held April 18-21, 2013 in Baton Rouge. We spoke with the festival’s founder and executive director, Chesley Heymsfield, to find out more about this exciting new event. 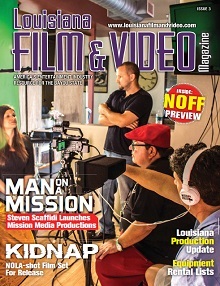 Louisiana Film & Video Magazine: How did the idea for the festival begin? Chesley Heymsfield: The festival started out of pure curiosity. After helping my parents move to Louisiana, I had heard that Louisiana was a high production state, so I went on a bit of a walkabout around the state, talking to all kinds of people directly and indirectly affiliated with filmmaking. The festival was borne out of us wanting to act as a crossroads and encourage local talent to interact with non-local talent. LFVM: What does the festival hope to achieve? CH: The Louisiana International Film Festival aims to provide a forum of discussion where people may build lifelong relationships and develop skills that enable them to play a central role in the industry. In general, established filmmakers enjoy contributing to the mentorship of new filmmakers—everyone remembers people who helped them when they were just starting out. These are amazing local opportunities where we can serve as a facilitator for natural networking and interaction. LFVM: What is your focus right now? CH: Our focus now is to get people on board with the festival. There is already a natural movement here, and we just happen to be a part of it. We are excited and fortunate to be surrounded by visionary leaders and have support from both the public and private sectors in Louisiana. We are very appreciative of support from the Office of Lt. Governor, Louisiana Technology Park, Noesis Data, Manship Theater, and others. We are reaching across Louisiana to reflect all of the state’s interesting and diverse cultures, traditions and people. LFVM: How would you describe your overall vision? CH: Our vision is to bring all the pieces together under one roof, where prospective and recurring productions may travel to one location to receive the latest updates about filming in and across the state. LFVM: What do you see in the future? CH: All major film festivals take time to grow naturally from the ground up with effort from many people, and so you have your short-term and long-term vision. Many of the festivals, such as Cannes, were even founded during difficult times, and the people gathered together to ensure the festival’s survival and prosperity. With any major community-driven endeavor, it’s the people who are going to make this possible. The people of Louisiana are our backbone. LFVM: What kinds of events will the festival hold? CH: The festival will have a yearlong presence with events, such as premiere film screenings, filmmaker discussions, and other interactive opportunities. And we will have our annual festival each year in the spring. Our inaugural festival will be held April 18-21, 2013 in Baton Rouge, where we will host a competitive juried film festival with the year’s best in celebrated independent film from around the world. LFVM: How can filmmakers get involved? CH: If you are a filmmaker interested in submission, you may check our Facebook page (Louisiana International Film Festival) and our Web site (www.lifilmfest.org) shortly for our submission guidelines. LFVM: Anything else you’d like to share about LIFF? CH: LIFF was created with the purpose of promoting the film industry’s indigenous growth, along with its international reputation as an artistic and financial force in the global film market. By virtue of acting as a hub for congregation and commerce, who knows how many opportunities people can create? That’s the exciting part; it’s unlimited.